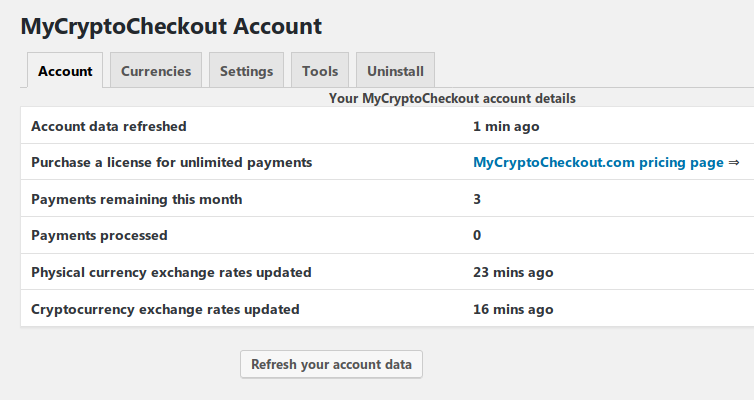 All users of MyCryptoCheckout are entitled to three free payments / purchases per month using the gateway. The free payments are automatically refilled at the beginning of each month. If you use all free payments before the month ends the gateway will disable itself. To get more payments, you can purchase a license for your account. The license entitles you to an unlimited amount of month payments. After your license expires, you will be again limited to three free payments per month. Use the purchase link from the account tab to purchase or extend your license.